Crown Casino in Melbourne is Australasia’s largest Casino. 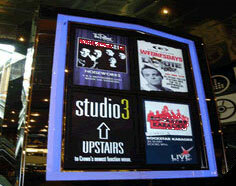 Wallflower Dynamic Digital Signage Software is used extensively throughout Crown for a variety of purposes. It is also installed at the Burswood Casino and Resort in Perth. Menu Boards. These allow different menus to be displayed at appropriate times through the day and for specials of the day to be highlighted. Towers of Power. A series of freestanding towers house 8 42 inch Digital Signage displays in portrait format. Each Digital Signage display shows different media and is used to promote movies, gaming and restaurants. Conference Room Boards. Wall mounted Digital Signage displays are sited outside conference rooms to show Conference information. General Purpose Digital Signage Displays. Other Digital Signage displays are located throughout each site for general branding and promotional purposes.